We’re welcoming a new team member. 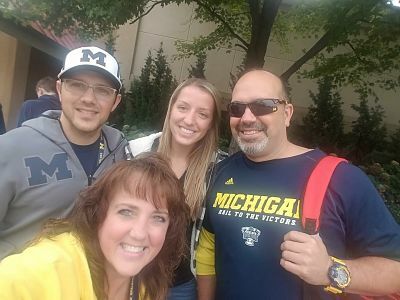 GJM is happy to welcome Joseph Osentoski (pictured to the left in the Michigan ball cap) to our audit team as a senior associate. Here’s a Q&A with Joe to help you get to know him. Describe your role at GJM: I will be assisting the firm with financial statement audits within various commercial industries such as construction, manufacturing, and services as well as employee benefit plan audits. I have more than 4 years of financial statement and employee benefit audit experience. When did you start working at GJM? November 26th. Why did you choose the accounting industry? I chose public accounting for the challenge and fast-paced environment. What do you like best about accounting? I liked the opportunities to work with a wide range of clients and businesses. Are you from the Toledo area originally? If not, where are you from? I lived in Toledo for 10 years, growing up before moving across the border to Temperance, MI. I lived in Rochester, MI while attending Oakland University through undergraduate studies and graduate studies. I moved to Royal Oak, MI upon graduation and I have been living in Toledo for the past two years. What do you like best about living in Northwest Ohio? Proximity to family. Do you have any pets, hobbies, family? I’m from a family of 6 (fraternal twin brother and younger sisters), German Shepherd Pitbull mix named Grizz, I enjoy attending sporting events, playing golf, mixing it up with friends and family. How do you like to spend your free time? Recently, I have been spending most of my free time renovating my home. What is something people may be surprised to find out about you? I made my first hole in one this past year at the Junior Achievement Chipping in “Fore” Kids Golf Classic outing at my alma mater. Established in 1996, Gilmore Jasion Mahler, LTD (GJM) is the largest public accounting firm in Northwest Ohio, with offices in Maumee and Findlay. Locally owned, GJM offers cloud-based accounting services and provides comprehensive services including assurance, business advisory, tax, risk advisory, healthcare management and outsourced accounting. The Firm's professionals specialize in industries including construction & real estate, healthcare, manufacturing & distribution and utilities.